Are you expecting a little one? Maybe there is one on the way in your family or among your friends? 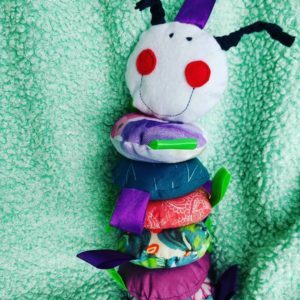 Join our baby toy workshop and create this unique soft toy for a toddler. Its smiley face and colourful body will bring joy and hours of play to any baby. No experience is required and you will finish it in class ready for that upcoming baby shower or birthday gift. Everyone, who would like to create this gorgeous soft toy. We will use a combination of machine and hand sewing, but you don't need to have a machine or experience as we will walk you through all the steps. 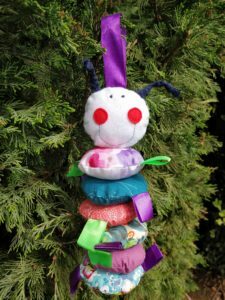 If you have any pieces of fabric you would like to incorporate to the toy, bring them along and we will make sure they are part of your new creation. 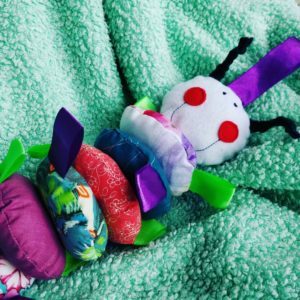 Using Toy Stuffing - creating stuffed toys is very rewarding, as it gives your creations a 3D effect while also being completely safe for the little ones. We will learn how to manage the fully material and ensure that the toy will be a long lasting piece. For our baby toy workshop, we will provide all sewing machines and accessories. In order to complete this project you will need fabric scraps to cut out 12 circles 10 cm in diameter. For more colourful effect, we recommend to use 6 different fabrics and cut out 2 circles from each. To make handles you will need 1 meter of 2.5cm-wide satin ribbon (you might want to use two colours, then you will need 2 x 0.5 meter each colour). You will also need 25cm thin elastic and matching thread. Fabric Packs will be available to buy in class, prices at 8 EUR containing everything you need for this project.